At its 2018 conference, the Labour Party pledged to support and fully recognise the people of Palestine. In a speech on 26 September, Jeremy Corbyn promised to challenge the “ongoing denial of justice and rights” for Palestinians. And for everyone in Palestine, support like this from other countries is absolutely vital. Because the violence hasn’t stopped, and the situation is deteriorating every day. And I want us to say with one voice that we will not let the tragedies of the Palestinian people go quietly into the night. We will rage… against the dying of the light, not because it’s easy thing to do, but because it’s the right thing to do. Our party is united in condemning the shooting of hundreds of unarmed demonstrators in Gaza by Israeli forces and the passing of Israel’s discriminatory nation-state law. The continuing occupation, the expansion of illegal settlements, and the imprisionment of Palestinian children are an outrage. Given Israel’s continuing use of live fire to kill unarmed Palestinian demonstrators, it is no surprise that there’s clear support for an immediate freeze of arms sales to Israel. Support and solidarity are vital. Because the situation in Palestine is horrific. As Corbyn noted, imprisoning Palestinian children is an “outrage”. And in a powerful animation, Gazan news agency Shehab News shows just how brutal this is. Since 2000, it explains, 11,000 Palestinian children have been arrested. These children are beaten, tortured and used as human shields. Trained dogs regularly attack them. And they’re denied access to their parents and lawyers. Israeli forces have continued to fire on Palestinians participating in weekly demonstrations against Israeli rights abuses near the fences between Gaza and Israel, killing 156, including 24 children, and wounding more than 5,000, since March 30. As HRW also explained, “Israeli authorities further tightened its closure of Gaza” in July. It has banned goods from leaving, and limited the entry of humanitarian supplies. But Israeli authorities haven’t stopped there. The [Israeli] settlers can build a villa, with electricity and a water source and a garden – and for us in the winter, we can build nothing. We put plastic on top of the metal to stop the water falling on us when we are sleeping. will give its Israeli inhabitants room to move… down to the highway and thus destroy the last of the Palestinian villages beside the road to Jerusalem. Another circle of Israeli concrete around the city will be complete. Israel is in violation of over 60 UN resolutions, while its Occupation policies violate several articles of the Fourth Geneva Convention and a range of international human rights and humanitarian laws. What’s more, the UK also licensed record numbers of arms sales to Israel in 2017. According to CAAT, this was £221m in 2017, bringing the total to £340m since Israel’s 2014 bombing campaign in Gaza – which killed at least 1,483 Palestinian civilians. Israel is now the “eighth largest market for UK arms companies”. 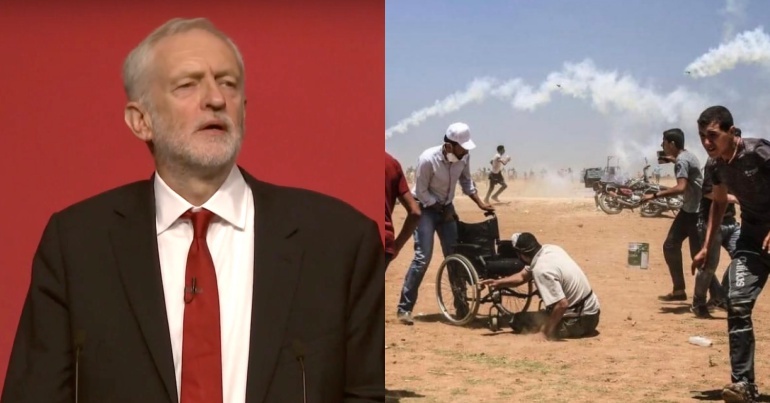 Corbyn and Labour’s promise to “recognise” Palestine and end arms sales is needed more than ever. So for the people of Palestine, we need Labour to take office as soon as possible. – Support the Palestine Solidarity Campaign. Also, find out more about the Boycott, Divestment, Sanctions (BDS) movement, and see previous Canary articles on Israel and Palestine. Theresa May’s DUP allies are under fire again. But they’re still propping up her government.